Being a construction worker is one of the most dangerous jobs in the world. When an accident causes serious injuries and death, it is especially horrific. In March 2015, three workers assisting in the construction of an office building in downtown Raleigh North Carolina lost their lives. Another worker suffered serious injuries after the exterior lift system they were riding detached from the structure. The accident occurred at a new Charter Square building located on Fayetteville Street. At the time of the incident, the men were taking apart a portion of the elevator system. The mobile scaffold platform ripped away from the structure and plummeted to the ground killing three men and injuring another. The falling platform crushed one of the workers while he was exiting a portable restroom below. An unidentified individual at the worksite called 911, claiming a construction crew was aboard the elevator platform at the time of its collapse. The deceased men have been identified as Durham residents Anderson Almeida, 33 and José Erasmo Hernandez, 41 along with Clinton resident, 33-year-old José Luis Lopez-Ramirez. The injured worker Elmer Guevara, 53 was transported to WakeMed. The 243,000 square foot Charter Square building is under development by Dominion Realty Partners of Raleigh. Choate Construction is the active construction site general contractor. Associated Scaffolding, a subcontractor working under Choate, is in charge of assembling, maintaining and disassembling all of the scaffolding used at the construction site. As a part of that day’s workload, some of the victims were in the process of dismantling scaffolding to relocate part of the system to another area on the construction site. The scaffolding was being used as a way to install glass “curtain” walls. The process included the installation of metal walls or thin glass as a part of the exterior of the building. Two accident victims were employees of Janna Wall Incorporated. In response to the accident that occurred just before noon, the North Carolina Occupational Safety and Hazard Division halted construction. The entire structure did not immediately fall to the ground as portions of the frame used to install the exterior glass wall hung outside, dangling from the structure for hours. Many construction companies have utilized mast climbers at venues across the United States since the 1980s. They are usually attached to large buildings under construction as a way for workers to install building materials to external walls. This includes installing glass windows, frames and other components. The mast climbers are considered a safe form of scaffolding and are known for their durable strength and carrying very large loads in multiple workers. However, the design does not always forgive even minimal errors where an accident can cause catastrophic results. Three men lost their lives in Austin Texas after falling from a mast climber in 2009. Another three workers lost their lives in 2006 in a mast climber collapse when dismantling the unit at a Boston construction site. Back in 1995, three workers lost their lives in Miami when a misconfigured scaffolding platform collapsed from overloading. Between 1990 and 2010, there have been 18 fatalities involving mast-climber collapses, accidents and incidences. 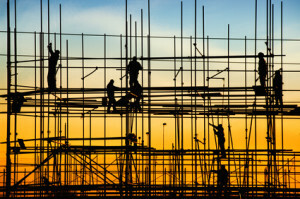 North Carolina law requires a full daily examination of the scaffolding system by a qualified inspector. However, both city and state governments do not inspect the mast climber. Apparently, equipment owners perform the inspection after receiving extensive training on the equipment by the manufacturer. Investigators are attempting to determine if the construction site contractors violated state law by overloading the system beyond its weight load limits. The general contractor has been cited previously for safety violations on other construction sites. The violations total seven times over the past decade. In one of the accidents, a worker not under Choate’s direct employment died at the scene when the Tennessee garage collapsed while under construction. In addition, associated scaffolding has received six violations in the last decade though none apparently involved fatalities. Installing and working on scaffolding equipment continues to be a dangerous occupation. Annual reports maintained by the state’s Labor Department indicate that one out of every 67 fatalities at NC construction sites is associated with scaffolding incidences.